The Financial Accounting (RHR FI) module in RHR is designed to capture organizations business transactions in a manner that will satisfy external reporting requirements. Local legal considerations are pre-delivered with the system and the ability to manage and report on multiple companies in multiple countries with multiple currencies is part of standard functionality. Integration with Sales and Distribution, Purchasing and Materials Management allows for the ability to select any financial transaction and "Drill Down" to the originating transaction whether it is a purchase Order, Sales Order or material movement. Company Code -Represents a legal reporting entity. There can be numerous company codes within an organization. Each has its own balanced books and reports itself as a single economic entity. Credit Control Area - If credit management is being used, this sets the general parameters for how credit is managed. The credit control area can control credit for a single company code representing a decentralized credit management approach or multiple company codes representing a more centralized credit management approach. 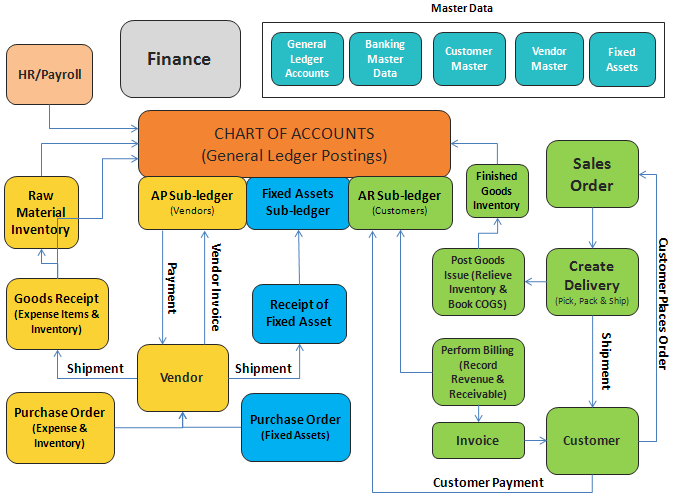 Chart of Accounts - The system supports single or multiple charts of accounts providing the ability to record transactions and report financially in many different regulatory environments. A chart of accounts can support multiple Company Codes if necessary. The Finance Module is designed to record financial transactions in a manner consistent with external reporting. External reporting must be in compliance with a country's accounting principles and is required for public entities, regulatory agencies and information required by banks and other lenders. The module also handles legal consolidations, receivables, payables, fixed assets as well as banking functions if required.